Congratulations to all the Scottish medallists at the 2013 British Youth Championships that were held in the EIS in Sheffield at the weekend. Full results now available in the attached PDF - well done all! Some great results for Scotland on the first day of the 4 Nations Veterans Home International. Especially from our Women's Sabre Team who won all their matches. Here are the results of the Scottish Schools Teams event held at Dunblane High School on the weekend of 16th/17th March 2013. Congratulations to Ruth Clarke on her silver medal in the women's foil event and to Georgina Barrington for her bronze medal in the women's epee event. Very well done to Justine Lambert who won a bronze medal in the Women's Epee and to Katie Smith who won a bronze medal in the Women's Foil. Results from The Scottish Open 2013 held at Meadowbank Sports centre, Edinburgh, 5th and 6th January. 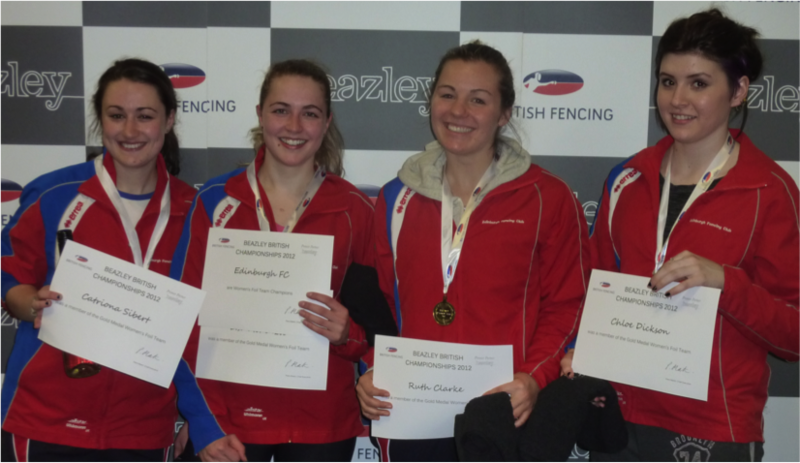 Edinburgh Fencing Club's Women's Foil Team won the Beazley British Championships 2012 Team Event on the 7th of October this year - a first in recent years for a Scottish Club. Results from the Scottish Schools Individual Championships 2012 which was held on the 3-4th November at Linlithgow Academy.